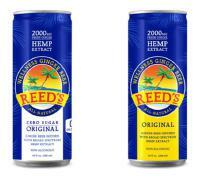 By the end of the second quarter of 2019, we intend to launch a pilot test of our Wellness Ginger Beer with Hemp Extract in the Pacific Northwest. Packaging will be consistent with our new base brand design with color differentiation in a 10oz sleek can to reinforce functional halo and separation from core offerings. Pricing is expected to be $3.99 SRP/can- in line with other hemp/CBD beverages. We will distribute this new product through our existing base Reed’s distribution partners in mainstream (where possible) and health/ natural food channels. Our goal is to deliver therapeutic effects of hemp to create a balanced functional beverage unlike any existing offerings. We are utilizing Nano Biologics – a proprietary broad spectrum hemp extract, water soluble nano emulsification technology that delivers superior bioavailability, faster absorption and higher potency than standard hemp extracts. Hemp based beverages appeal to a large and growing consumer base demanding innovative, functional, health & wellness beverages. Hemp/CBD is non-psychoactive and has claimed therapeutic benefits including pain relief, reduced inflammation, reduced anxiety, sleep aid. ● This category includes range of fortified/enhanced products (i.e., energy/sports/probiotic) and is the fastest growing segment within global non-alcoholic beverages projected to grow 8-10%. ● The Hemp/CBD market is projected to be $2 billion by 2020, with Hemp-infused (non-THC) beverages projected to be a $260 million category by 2022. We expect to launch the pilot test of our ready to drink Mule in Southern California and the Pacific Northwest by the end of the second quarter of 2019. Packaging will be consistent with our new base brand design with tie to iconic copper Mule imagery. Pricing is expected to be $9.99 4-Pack SRP. We will distribute this new product through our existing distribution partners that are also leading beer and spirit distributors in mainstream and liquor channels. Full Annual Report on Reed’s Inc FY 2018 and 2019 Expectations here.